Overlord Services brings you years of experience in our field and a commitment to your safety. Whatever your inspection needs—for elevators, moving walkways, escalators, wheelchair lifts or any other device that moves people and things—you can trust that you're getting the highest standard of service possible at the best possible price. Our inspector is NAESA internationally certified and Virginia state certified; we are an insured inspection company that can meet all your business needs. Whether you own or use any device that moves people and materials, safety is paramount. Those devices need to be properly inspected upon installment and on a regular basis thereafter. Overlord Services can do that for you. 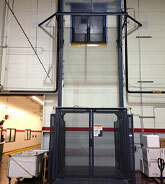 We perform elevator safety inspections, cargo lift inspections, escalator inspections and more. See our services page to see what else we can do for you. We have the necessary expertise and knowledge, backed by years of experience, to determine whether your device meets Code specifications at the time of installation and thereafter or whether it may have contributed to an accident. We welcome opportunities to undertake inspections and accident evaluations throughout Virginia and to provide consultation on installation of new devices or modifications of existing devices anywhere.